← Spring Pop Up Legal Clinic with WALA and GW scheduled for March 18th! 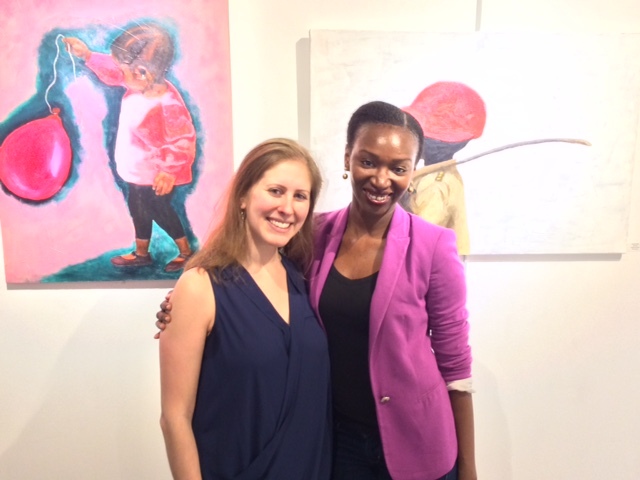 On April 10th, 2015 Washington ArtWorks opened Hang the Lawyers, an exhibition of artwork created by attorneys and law students of the Washington, D.C. area. In partnership with Washington Area Lawyers for the Arts, the walls of Washington ArtWorks’ two galleries are now filled with art of a variety of media. Hang the Lawyers is a unique exhibition no to be missed! Former IP Clinic Practitioner Nabila Isa-Odidi Aguele was on hand to see her paintings on display. Joining her was Ali Sternberg ’12. This entry was posted in Clinic News and tagged Ali Sternberg, ArtWorks, law students, wala, Washington Area Lawyers for the Arts. Bookmark the permalink.